When Did We Become Mentally Modern? Our ability to think in symbols -- the notion that objects can represent ideas -- is one of the key traits that make us human. We weren't always symbolic thinkers, and scientists are trying to figure out when our minds evolved this ability. When Did We Become Mentally Modern? Ever since Darwin came up with the whole idea of evolution, there's been one dominant picture of the moment we truly became human. It's that cartoon sequence: You see a hairy ape man with a heavy brow hunched in profile. Then, bit by bit, his back uncurls and straightens until all of a sudden there is he, upright, truly a man. Recently I've been thinking about this image, because I've decided that we somehow ended up with the wrong one -- that there's something much more fundamental to being human than our ability to stand upright. Every sound that comes out of my mouth has some kind of arbitrary meaning assigned to it. I could just as well be talking to you in another language and making totally different sounds and saying the same thing. 1. About two hours before you'd actually like to be conscious the numbers on your alarm clock hit that magical combination, 6:15, and suddenly your room is filled with a sound indicating that you are doing something terribly, terribly wrong. 2. You make the alarm stop and head to the shower where you listen to the news -- talking heads who fill your brain with different pictures from faraway places. 3. Then comes the problem of trying to dress yourself for work. You leaf through the hangers in your closet in search of something that might suggest competence, professionalism, a sense of purpose. You go through a lot of hangers. 4. Finally you find something, but as you're zipping yourself up your 3-year-old comes in and decides that the closet is not in fact a closet, but a train headed for a distant locale. "We're going to ASIA!" he screams over and over as he opens and closes the closet doors about 2,000 times. 5. You head to the coffee shop for a cup of joe, give the nice woman behind the counter $2, and stumble out the door to work. You have been awake for approximately two hours and almost every moment in your day has been predicated not on your ability to stand upright, but on something else entirely -- your completely underrated, chronically overlooked capacity for symbolic thought. Thinking symbolically is the foundation of everything we do -- we live in a symbolic world. I know what you're thinking: Just what is symbolic thought? If you're fuzzy on this, don't feel bad. A couple of weeks ago I took a tape recorder around NPR to see if anyone could cough up a decent definition, and basically what I got for my trouble was a tape full of "umms," and the sound of people staring at the ceiling. So then I posed another question: Name five symbols. This was much easier. In fact, an intern named Connor Donevan reeled off close to half a dozen in under two minutes. The Christian cross, the American flag, a wedding ring, a designer label. When we think about symbols, these are the sort of things that come to mind -- signs that act as a stand-in or shorthand for a whole set of ideas. But in fact symbols play a much larger role in our lives. Let's return to one of the most basic parts of your day. Getting dressed. Every piece of clothing you place on your body is a symbol. That leather motorcycle jacket or button-down polo communicates to the world who you are, what you believe in, and where you sit on the social ladder, and it does that instantly. Alison Brooks, an anthropology professor at George Washington University, points out that her school is located only 30 feet away from the office of the World Bank, so students and bankers are constantly walking the same streets. But, she says, you can tell in a second which ones are the students and which are the bankers. "Because the students dress like students and the world bankers dress like bankers. The [bankers] all wear suits or very formal clothing. Each of those different populations gets up in the morning and puts on symbols of their status." Now let's consider the next moment in your day: Your 3-year-old has declared that he and the closet are going to Asia. Asia, like America, is a concept that depends on our ability to think symbolically. America exists only because a group of people got together more than 200 years ago and decided that this great mass of land directly to the south of Canada should bear that name. California wasn't America, and then it was. It became America because a group of people decided -- more or less out of thin air -- that it was. And then they fought a bunch of other people to turn this abstraction into reality. The money you passed to the lady at the coffee shop -- a symbol of the gold in Fort Knox, which it itself, is symbolic of something else: power. And finally there's the stuff you heard coming out of the radio during your shower: language. In order to have language, any language, you need to be able to think symbolically. Think of the word "cat." Even though the written word C-A-T looks nothing like a cat, and the spoken word "cat" sounds nothing like a cat sounds, when someone says the word out loud, you're able to conjure up an image. Language, says anthropologist Brooks, is entirely composed of these arbitrary symbols. "Every sound that comes out of my mouth has some kind of arbitrary meaning assigned to it," she says. "I could just as well be talking to you in another language and making totally different sounds and saying the same thing." The miracle is that these arbitrary sounds -- these symbols -- allow us to see what's going on in other people's minds and also allows us to share what's going on in ours. For example, if I say the word "bead" you immediately have a picture in your mind of what I'm talking about. If I said beads, you'd generate a slightly different picture in your mind, that I have made your mind form. If I said glass beads -- using an adjective to modify the concept -- you'd immediately see something different than if I said gold beads. In this way, I make you think in your mind of a thing that I have in my mind. And once we have this ability for symbolic thought and language then all kinds of things become possible. Through language we can pass down what we've learned, organize larger and larger groups of people who can do more and more complex things like build bridges and schools and computers and practically everything else in modern life. The question to answer, though, is when did we get like this? When is the first evidence that we had acquired this magical ability and were finally mentally modern? Museums are full of bones under glass -- fossils that can tell us when we became physically modern. But how do you find a fossil of a symbolic thought? Not very long ago a man named Chris Henshilwood stumbled upon one possible answer to this question. Henshilwood is an academic in Norway, but when he was a small boy, he would often visit his grandfather's farm on the western coast of South Africa. It was there one day in his youth that Henshilwood discovered a cave half obscured by a sand dune. Thirty years later, when Henshilwood was no longer a boy but a new archaeologist trying to make a name for himself, he went back to that cave and, under a layer of sand, found several dozen seashells that dated back 75,000 years. "They are the size, or even smaller, than the nail on your pinkie," Henshilwood says. "They're very tiny little shells, and really if you don't look at them carefully, they are rather insignificant." Henshilwood originally dismissed the shells -- he assumed they were leftovers from meals or other activities. But then he put them under a microscope and noticed that each of these small, insignificant shells had a tiny hole in its lip. And that's when Henshilwood had his epiphany: These shells weren't simply shells -- the shells were beads. "The hole that had been made was in the same place. I could very clearly see under the microscope the wear that had been made by the string or whatever had been used to string these beads together," Henshilwood says. "And by the time I'd looked through 30 I was convinced -- these are beads. 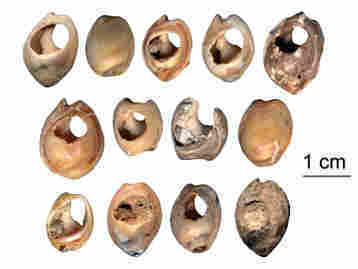 These are the oldest beads yet discovered." Why are a few shell beads such a big deal? Upload your image or drawing of evolution to Flickr, tag it as "nprevolution" and add a brief description in the caption field. We'll be watching -- and we'll post our favorites right here at NPR.org. The handful of shells Henshilwood found was an early version of the wedding band on your finger or the golden cross around your neck. The beads were symbols -- symbols that indicated to the people of that community who this person was, what he believed and whether he was friend or enemy. So with all of this in mind, I'd like to make a proposal: It's time for a new iconic image of the moment we became human. And here's the one I suggest: A hairy ape man with a thick brow sits crouched, working a tiny hole into a small shell. He pushes a strip of animal hide through the hole. And -- suddenly -- you and I are born.